As first-year students and parents arrive on the University of Redlands main campus, a new online interactive map will make finding their way around an easier and richer experience. 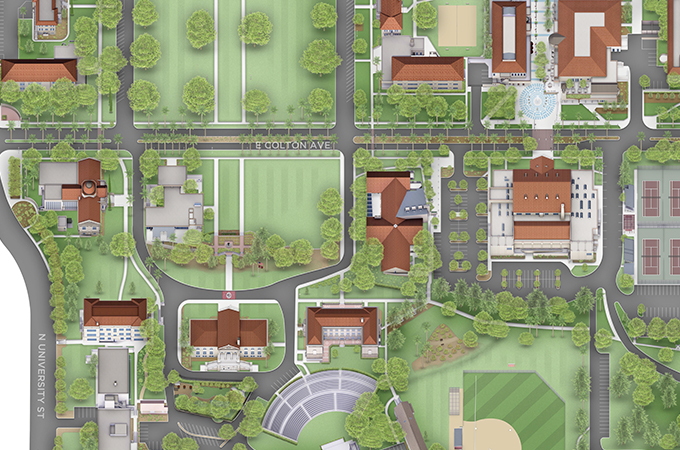 The map, which can be found on the University website and in the new mobile app, highlights many different aspects on campus, from housing and academic department buildings to lighted pathways and emergency phones. The University Communications creative team collaborated with an interactive, virtual experience expert partner, Concept3D, to design and produce the map, which supplements the University’s two-dimensional map, virtual campus tour (which also features the new map), and the more data-driven maps created by students and faculty in geographic information systems (GIS) academic programs. Prior to arriving, visitors often like to get acquainted with the site so they know their way around and can figure out where they want to spend their time. If students already have a major in mind, they may want to research that particular department’s location and get a feel for the classrooms and available resources. “This map is valuable because it gives users a sense of place, which is something that doesn’t translate through the 2D map,” says Alvarado. While Redlands’ campuses throughout Southern California are not illustrated, their locations are displayed via the top navigation bar. A version of the map was used in a story in Och Tamale magazine featuring the traditions of the University of Redlands. In the coming year, new features will be added to the interactive map such as 360-degree videos and self-guided campus tour routes. The map may also be used to help communicate venue locations and parking directions for major events, such as Homecoming and Commencement. Take a look at the new campus map: campusmap.redlands.edu.